The days are growing warmer and that means your family will spend more and more time outdoors. If the outside is going to be an extension of your home, there are 5 essential elements you’ll need for outdoor fun and relaxation. Backyard barbeques and chasing fireflies are what warm weather memories are made of. Of course, you’ll need somewhere to sit and relax while outside. Gorgeous patio furniture is the best place to start. Make sure that it matches your style. Do you mainly eat outside? Then you’ll want a table and chairs. Do you sit and chat? Chairs and small tables might make more sense. Choose a fabric that you love to go on the cushions. Making the outdoors seem like an experience requires a bit of forethought. Don’t just stop at the furniture; add an outdoor rug to the center of the seating area and jazz things up with a potted plant for a centerpiece on the table. Since some time spent outdoors may be early in the morning or late at night, you’ll want to add some lighting options. Patio lights can be solar or electric. You can even purchase lights that look like standing indoor lamps, but are made specifically for outside. Stringed lights can add a fairy tale quality to your patio area. Nothing will spoil outdoor fun faster than flies, bees and mosquitoes. There are a few ways you can protect your outdoor living area from pests. You can add a screened area that surrounds your furniture or you can purchase a bug light or citronella torches or candles. Whatever method you choose, make sure it works for your lifestyle. For example, if you have small children, burning torches or candles might not be the best solution. The final thing you need to truly make your outdoor living area an experience is family and friends. 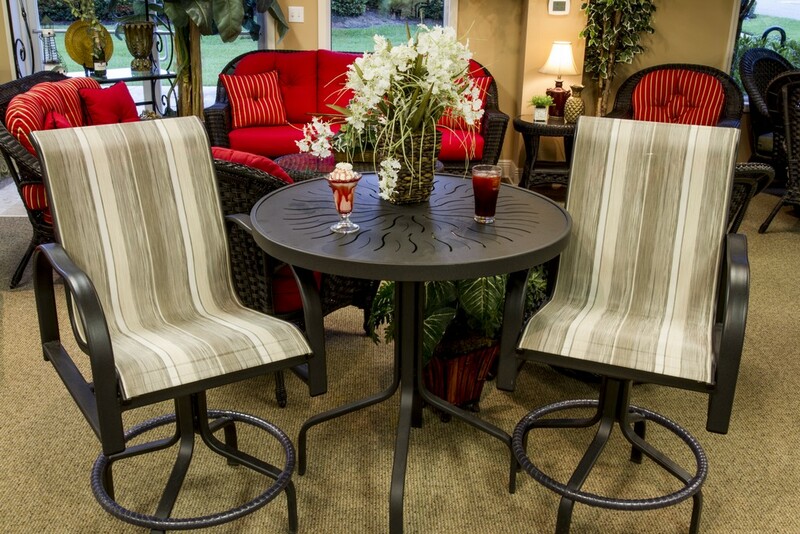 Make sure you have enough seating room to invite people over and share your beautiful patio with them. Need some additional ideas for patio furniture and coverings? Palm Casual has a full selection of options that match any style.